This hotel is conveniently located near Montreal Airport and within easy reach of the city's vibrant downtown, Olympic Park, Casino de Montreal, and the Bell Center. The hotel features an indoor pool, a fully equipped fitness center, and offers complimentary shuttles to and from the airport. Spacious accommodations feature plush beds, FREE WiFi, HDTV and more. 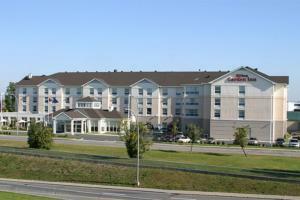 Located just approximately 3 miles from Montreal-Pierre Elliott Trudeau Intl Airport.